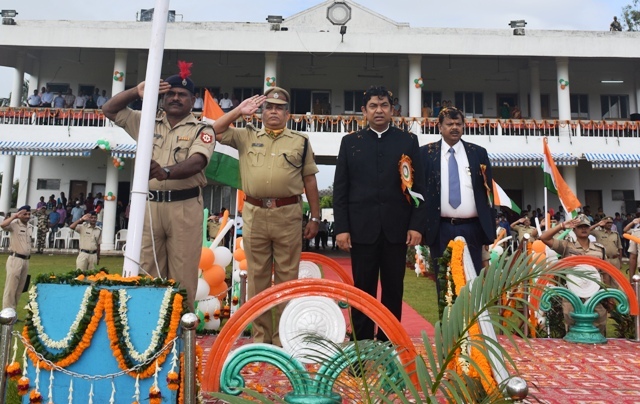 The 72nd Independence Day was celebrated by Paradip Port Trust Authority on 15 August. Shri Rinkesh Roy, Chairman, PPT, unfurled the National Flag and took salute from platoons consisting of CISF Jawans at Gopabandhu Stadium. Addressing on the occasion, Chairman, PPT, informed that PPT has been consistently maintaining the 2nd position in terms of traffic handled amongst all Major Ports. It has undertaken great strides in each area of its activities and has witnessed 11 % growth in terms of cargo handling in this fiscal, compared to last year during the corresponding period. Cargo handling operations have commenced from March, 2018 in the Multi-purpose Clean Cargo Berth of 5 MMTPA capacity for handling of containers and other clean cargo. A New Iron Ore Berth is expected to be operational by this year end. Construction of LPG Terminal at South Oil Jetty by IOCL of 0.75 MMTPA capacity is in full swing. PPT is going to award a project for Deepening and optimization of Inner Harbour facilities including development of Western Dock Captive Berth (2 Nos.) of 30 MMTPA capacity to handle Cape-size vessels with an estimated cost of Rs. 2000 Cr.